Here is a list of Cabinet Ministers in India which will help you in exams like UPSC, BPSC,SSC MTS.SSC CHSL, SSC CGL,Railways and other Banking Exams like IBPS, RBI, SBI Clerk etc. 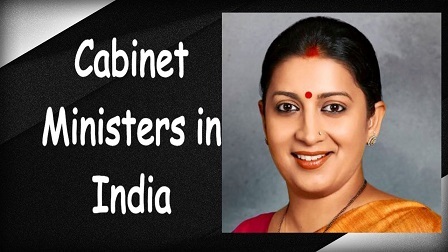 List of Cabinet Ministers in India is an important static GK topic for MBA, Bank PO and other competitive exams. You can expect at least 1 to 2 questions from Cabinet Ministers in India in any competitive exams. Union Council of Ministers exercises the executive powers. It is composed of all the Union Ministers – Cabinet Ministers, Ministers of State and Deputy Ministers. Cabinet Ministers are those who are members of the Cabinet and are real policy-makers of the Council. Union Environment Minister Anil Madhav Dave died of a cardiac arrest, Dr. Harshvardhan was given additional charge of the Ministry of Environment and Forests. Prakash Javadekar got HRD portfolio, Smriti Irani moved to textiles. Venkaiah Naidu got Information & Broadcasting, retained Urban Development. Minority affairs minister Najma Heptulla was dropped from the cabinet as her age was not on her side as she turned 76 in April. 33. Piyush Goyal Power, Coal, New and Renewable Energy, Mines.